One of my children has a mood disorder. I don’t want to violate his confidentiality, so I won’t tell you which one it is. In case you’ve ever wondered what it might be like to parent a child, teen, or young adult with a mood disorder, I will help you out. It’s like riding a rollercoaster all day long while trying to do everything else you need to do. I get quite a bit done while we are clicking along on the upswing, but those plunges, well they can be downright challenging. That's me trying to make a business call. Well, not really, but you get the point. I’ve taken to keeping lids on my drinks. Don’t get me wrong.. he is a fun and funny kid. 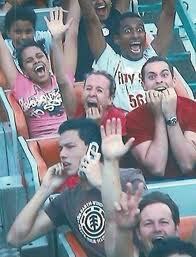 It’s just that trying to do the rollercoaster thing every day, well, it sometimes wears you out. To be fair, I’m sure he gets weary too. Hopes its all up today, and not much down!